I had planned to release my first audio book early this year, but now I’ve decided to record new vocals for the songs that accompany my book’s stories. 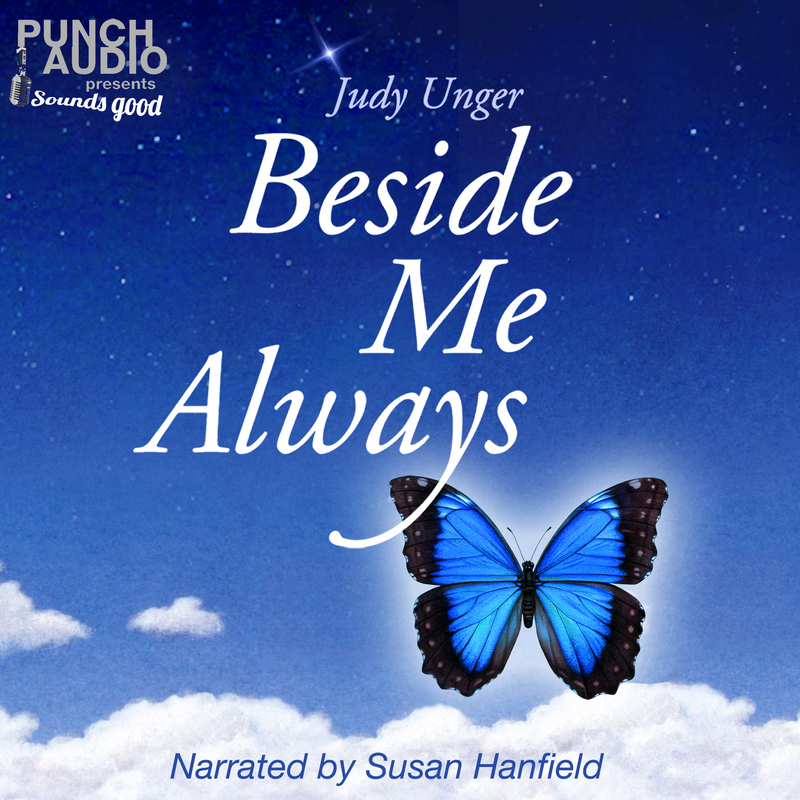 Much of my current writing and new songs are material for a second audio book that I plan to create. For such a long time, my children and husband were skeptical and annoyed with my confidence about the new direction in my life. I stopped sharing anything about it with them and kept everything to myself. The joy that came from my music and writing was tempered by the fact that my family saw no monetary value in it. Although my income as an illustrator had considerably shrunk from what it was a decade earlier, I still had a steady revenue from my stock illustrations. I always held out faith that there would be a custom assignment; occasionally they came along to fuel my faith just when my self-esteem was at a low point. Once again, this happened for me! It might be awhile before I post again because I received a large project this week. I will be painting many fruit illustrations that will be used on yogurt labels for a national brand. 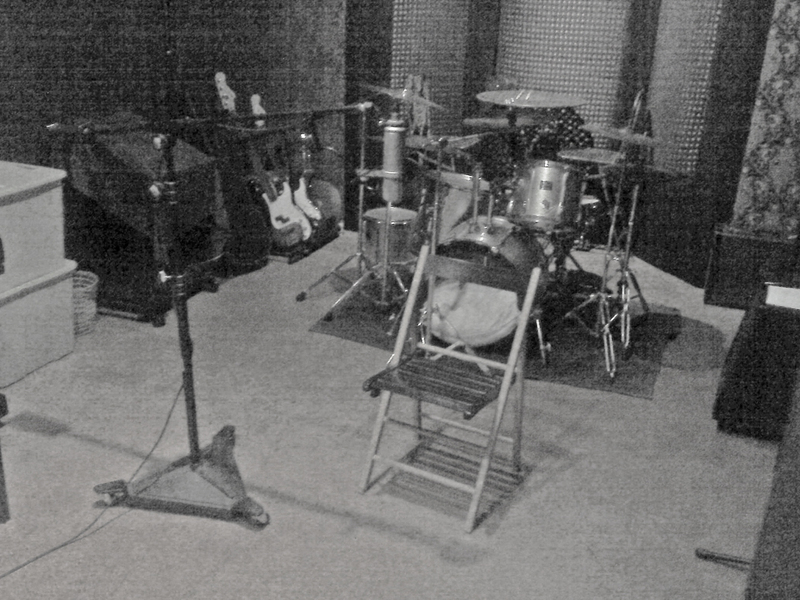 A quick photo taken with my cell phone, I sit in that chair and sing vocals for my songs. I could not have passionately pursued my love for writing and music without separating from my husband. There are arranging and recording costs that I now bear – and gladly. Although my soon-to-be ex thought he was supportive, I felt uncomfortable continuing to spend our money on something he felt was a drain. It was as if I was keeping a secret from him. Initially, I didn’t feel that way. But one day I woke up to the fact that I was only able to truly express myself through my song lyrics. The sadness of that overwhelmed me. People who read my blog and heard my songs understood me better than my own family! With my separation, I heard this line from my husband of: “You probably need to go out and get a job.” Initially I thought that might be true, especially since I wouldn’t have health insurance. But life is all about choices. Certainly, when I went to buy my first car in 20 years – I didn’t splurge on a sports car! (I leased a Honda Civic, which I am enjoying). I’ve chosen a frugal lifestyle in order to pursue my passions. With my father’s death, living in the coop where I grew up was a wonderful opportunity for me. I am also thankful to have both of my brothers supporting me in this decision; they have really been there for me. I plan to pay them for their interest in the coop once my former home sells and I receive money from it. I see great value in what I am doing with my life and where I am going. I am unapologetic. I believe I am the richest woman in the world! 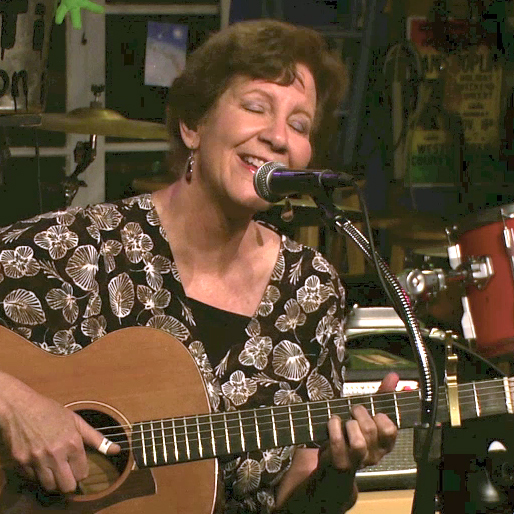 There is a wonderful line in my song “The Unknown.” It is: “I go to places that heal me.” That is what my life is about; I heal myself and hope to heal other people, too. Below are some words I wrote two months ago. With my divorce agreement pending, it was not in my best interest to talk about how devoted I am to my music. 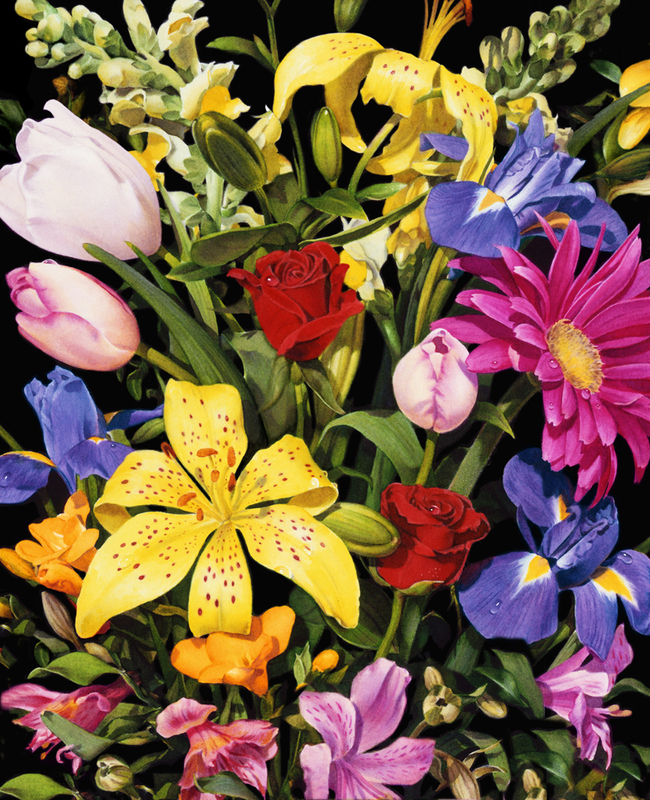 Prior to rediscovering my love for music and writing at the age of fifty, my career was one as a commercial artist. Throughout the time I was an illustrator, my children were my highest priority. My firstborn child, Jason died at the age of five. Because he had a congenital heart defect, I needed to by very involved with his care. I was fortunate I worked at home and was able to be alert to his needs. For many years, I also advocated for my three living children in order to obtain whatever services they needed in school. When I began my blog, I wrote a lot about them and what being an advocate entailed. My motive was to help others who were also struggling with similar issues. I also wrote to release trauma I carried due to many tough situations involving my children. Six months after writing about those experiences, I deleted most everything that related to my family. In the beginning, they gave me permission to write and share things about them. But many things changed after I suddenly “woke up” and was not the same person I was before I found my joy. My family did not want anything to change, especially the doting mother that I was before. When I started writing my blog and singing again I never imagined that I’d find something completely separate from my children to write about! 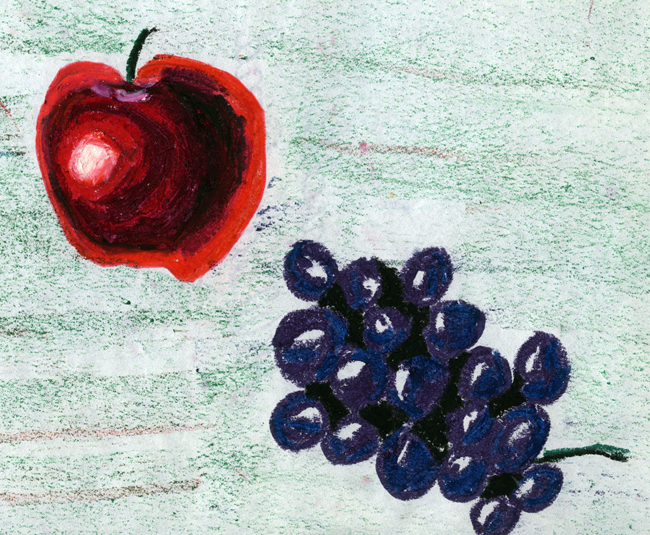 I was illustrating fruit when I was seven. I might never have discovered my love for writing and music if my career as an illustrator had continued to keep me busy. When I was receiving a lot of work, I managed to juggle all the things I dealt with related to my children, parents and household responsibilities. But gradually my workload diminished and custom assignments were rare. Many of the people whom I worked with in that industry were also left without jobs – art directors, designers and agents; there were so many people who needed to reinvent their careers. I bemoaned how computers decimated artistry and eliminated so much of the human creative process. I complained how digital paintings were nothing compared to my original watercolor paintings. But then I completely readjusted my thinking! 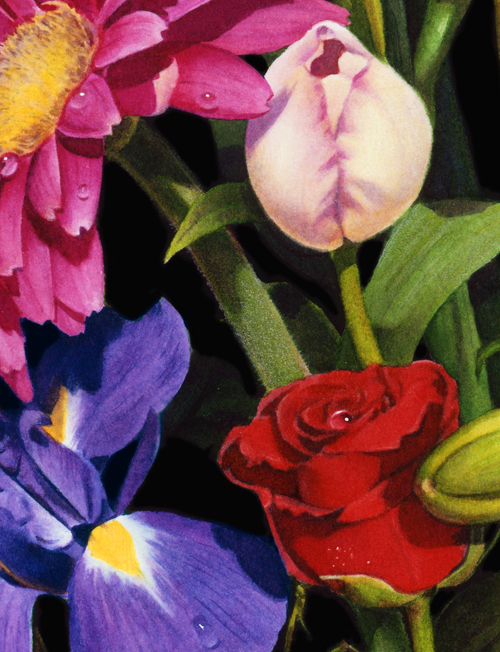 A close-up of one of my watercolor paintings. 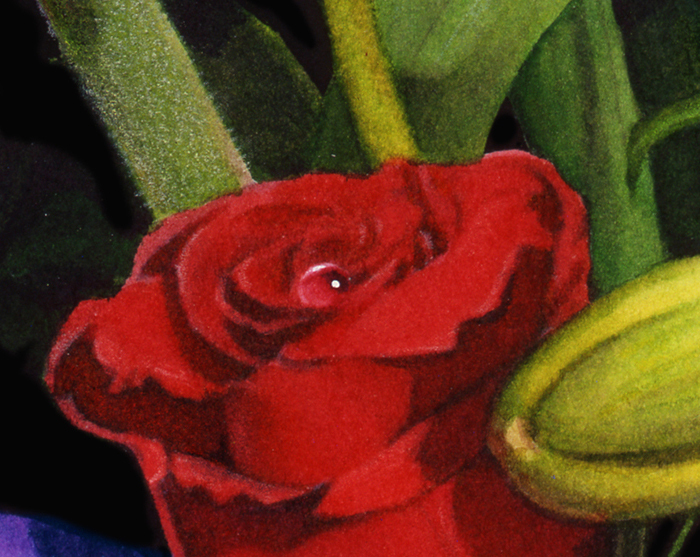 I love the fuzz on the stem, which I created with colored pencil. Music, writing and art combined with my computer have made my world richer than any palace on earth! I believe that this time period was the perfect one for me to be born into. The computer has allowed me to create things that I never believed were possible. I love how I can type fast and furiously to capture the words I hear in my mind. But I do not use my computer for composing my songs. They are done with a pen and paper and my beloved acoustic guitar. Writing song lyrics is a process that I find quite mysterious. I do not choose to write them. I hear a song and when I sing, the words are there. I have composed and recorded unique guitar arrangements for many of my songs. I transfer my recordings to a computer where I can edit them. Then with the help of my arranger, George, instrumentation is added until my song becomes a magical symphony. The process of editing vocals was something I taught myself. I compile a vocal line using the best parts of numerous takes. Creating unique images for my blog also gives me the opportunity to utilize my artistic abilities on the computer. I’m adept at Photoshop and love using my own artwork and photographs. Overall, the computer has made writing, music and illustrating fantastic for me. I believe there are no limits to what I can do creatively. And there is one simple reason for it. It is because I have given myself permission. At the age of 53, I’ve decided this time is my renaissance. I embrace it and I love it! My statement of giving myself permission to allow for creativity is a huge one. On so many levels, it is about believing in myself. I really do feel that I have a lot to offer the world. Allowing myself full creative expression after decades of stuffing everything inside, has allowed me to heal. The musical of my life is exploding from my heart and I cannot hold it back anymore. Plus, I’ve decided that this is my life and the way I want to live it. Even without a “real job,” I am determined to find ways to continue my renaissance. I have dedicated my life to creating music, songs and stories, which I hope will inspire and heal many people. I have a few things I can share – a lot has been going on for me! First of all, my children are doing well. They are adjusting and I am proud of all three of them. For two months, I have had some continuing eye issues. I followed my good friend, Dr. Sam’s suggestion and saw a retinal specialist outside of my HMO for another opinion. It turns out that the fogginess in my left (and right eye, too) is a separate issue from my floater episode. There is a remaining edge to a cataract, which sometimes intrudes and is cloudy – a simple laser procedure can eliminate the cloudiness and solve my problem. The procedure is scheduled in two weeks. I am trying hard to find out if it could happen sooner. My divorce is proceeding. There are many issues left regarding back support and money related to our homes that our lawyers are working on resolving. But child and spousal support has begun for me! The agreement was signed at the end of February. Our home went on the market a week ago. It sold for well over the list price – we had 8 offers! The housing market is definitely cooking. 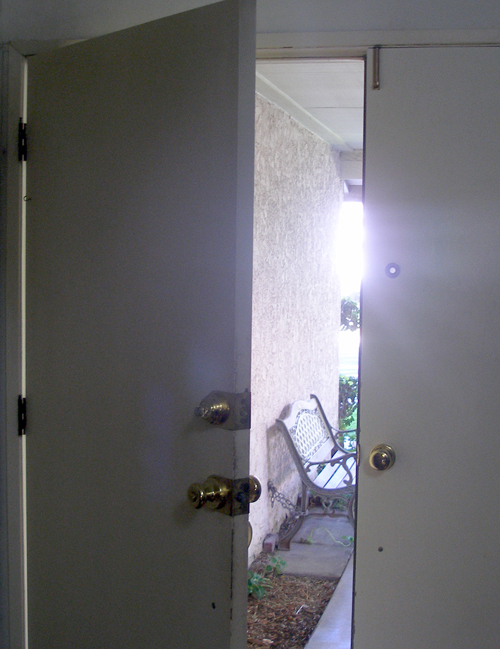 Escrow opens on Monday and our broker said it would take 17 days to be sure if our sale will go through or not. So I am crossing my fingers. My husband and oldest son do not yet know where they are moving. My mother continues to hang in there. 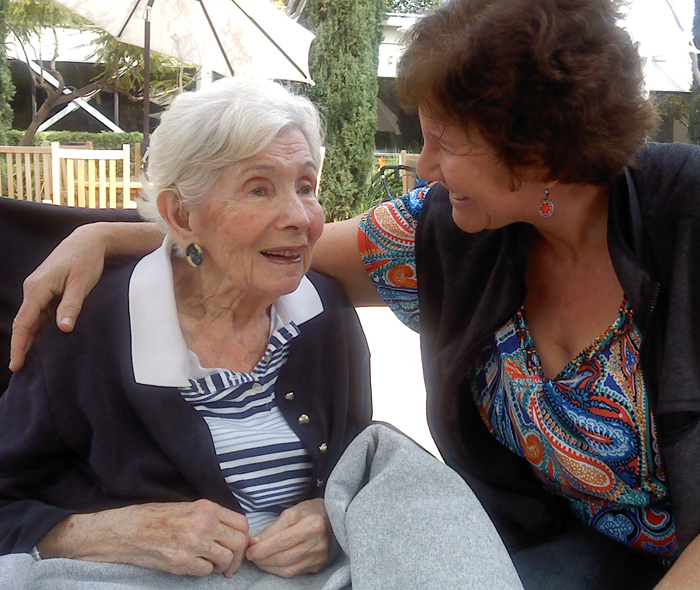 She cannot communicate much – but she still recognizes family and she can say, “I love you.” I go out with her to lunch in a restaurant two times a week. Miriam (my mom’s companion) dotes on her and my mom adores her. I am living in a small coop/apartment with two of my children in North Hollywood. I have been devoting myself to my music. I found a wonderful recording studio near my apartment where I am recording vocals for the music CD that will accompany my book. The musician helping me is named Darrin, he is extremely talented and his parents have become wonderful new friends of mine. But my music must pause briefly because I was awarded a large illustration assignment this week. It will keep me very busy for a while. Things are definitely looking up for me! 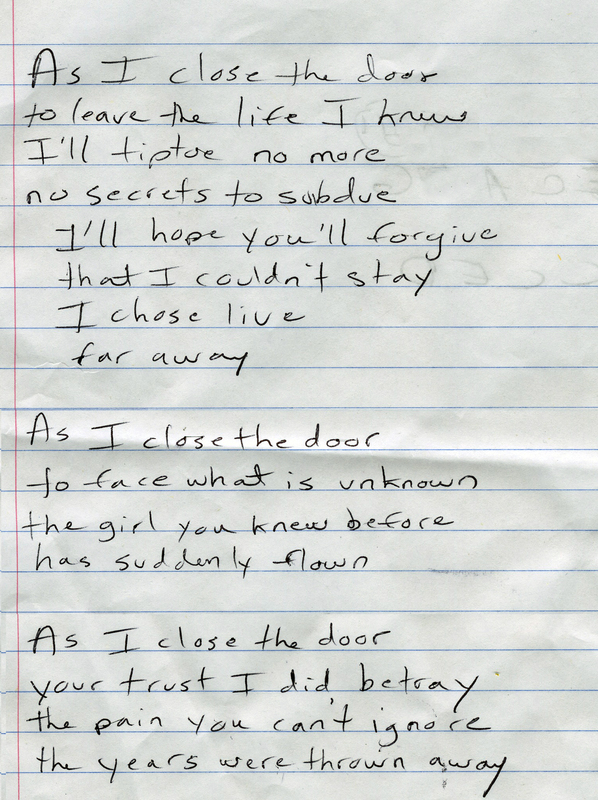 My post title is a line of lyrics from my song “The Door.” I have not yet publicly shared two of my songs. I plan to share my song “The Door” very soon. This entry was posted in Healing and Hope and tagged acoustic guitar, Aging Parents, Art and Illustration, Caregiving, composing, coping with divorce, creativity, digital illustration, divorce after a long marriage, facing divorce after a long marriage, floral painting, gray divorce, grief, GRIEF RELATED, guitar, healing, healing and grief, Illustration, illustrator, inspiration, loss, lovesong, lyric development, lyric writing, lyrics, mother, mother daughter relationship, mother's illness, Music, original songs, separation, separation and divorce, singing, songwriting, voice lessons, watercolor painting, watercolors, writing. Bookmark the permalink. Each time you share your heart I am more and more certain of the creative gifts you possess, Judy. I wish you continued success in your pursuits. Gosh, Judy, I almost went to bed tonight without looking at FB — but so glad I did. This is wonderful. Your voice is coming through loud and clear and I am so pleased to have known you back in the day and can so appreciate your growth. I know you will succeed in whatever you do and I wish you only love and happiness in your new life. My friend you are so unbelievably talented. I LOVE your illustrations! What a wonderful post. My gosh, this is a beautiful post. I love the photos. That art by you when you were SEVEN is astonishing. I remember being 7 – my mum had just suicided & I was in an orphanage. But what I remember most was how SO NOT was my mind in such a beautiful place. Truly wonderful art. Noeleen, I read your post “It.” It was gripping and unbelievable what you have gone through. Your comments and support are very appreciated. I was blessed with a sweet childhood and although I’ve had challenges later in my life – you inspire me with your ability to rise from tremendous tragedy in your life. Writing is a beautiful thing – so healing, isn’t it? I am glad you are part of my “blog family!” I look forward to reading your writing.